Prime Minister Shri Narendra Modi is set to embark on a two nation tour of China (to attend a BRICS summit) and Myanmar (his first bilateral visit to Nay Pyi Taw) in September after a brief hiatus. While PM Modi’s China visit is likely to get all the Media attention thanks to the Doklam India – China standoff, it is in Myanmar – India’s Gateway to South East Asia where India’s vital strategic and economic interests lie in a World, more specifically Asia, where China is becoming a major pole thanks to its economic heft and military might. India shares a 1600 km sensitive land border, infested by militant rebel groups acrimonious to both nations and a maritime border with Myanmar. Myanmar, then Burma, was till 1937 administered as part of India by the British colonial administration. In addition to various social, economic and cultural ties, India shares a 1600 km sensitive land border, infested by militant rebel groups acrimonious to both nations and a maritime border with Myanmar. While shared interests in national security are likely to dominate Prime Minister Modi’s agenda in an increasingly democratic Nay Pyi Taw where the military continues to hold power and representation in Myanmar politics and parliament, India’s foreign policy increasingly needs to learn the doctrine of reciprocity – Give and Take – beyond the highlighting of abstract principles without producing meaningful results. 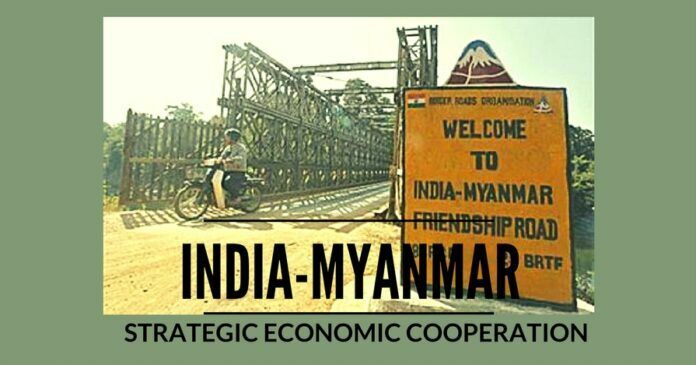 In this piece, I outline two areas where major strategic economic cooperation can take place between India and Myanmar. Myanmar is roughly one fifth the size of India and has a population of merely 5% of India’s. The Irrawaddy plains are as fertile as those in Punjab or the Ganges. India can share its resources and experiences in bringing an Agricultural Green Revolution – mechanised farm equipment, drip irrigation, fertilizers and high yielding varieties of seeds – in Myanmar through Lines of credit dedicated to Farm Mechanisation imports from India and commit to buying the surplus produce of pulses and oil seeds, of which India faces a perennial shortage. Myanmar, as India’s Gateway to South East Asia, is a vital cog in India’s regional connectivity project – the South Asia Sub-regional Economic Cooperation (SASEC) initiative, our own counter to China’s Silk Road or One Belt One Road (OBOR) – albeit at a much smaller scale. India is already involved in the Kaladan Multimodal Transit Transport project , Sittwe Port Project (where China is reportedly building a naval base) and the India Myanmar Thailand (IMT) road project. India must also consider to extend the India Myanmar road project to Laos and onwards to Vietnam and Cambodia. India needs to do far more than this. Even when India is involved in the development of Sittwe Port Project, there is no Air connectivity between India and Sittwe which has the potential to become the commercial powerhouse of Myanmar. India must also consider to extend the India Myanmar road project to Laos and onwards to Vietnam and Cambodia. In August, 2016 India created a Rs 500 crore Project Development Fund (PDF) to augment India’s economic presence in the CMLV countries (Cambodia, Myanmar, Laos and Vietnam). India must further add resources to this and also involve India’s private and public sector behemoths as well and emerging tech start-ups to set project and businesses in these countries. The author is a member of the Institute of Chartered Accountants of India.